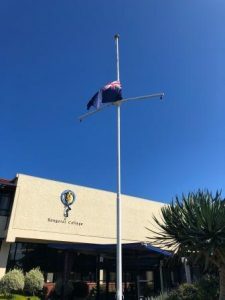 Following the horrendous terrorist attack that occurred in Christchurch on Friday 15 March, we held a special assembly at school on Monday morning. Our boys and staff were addressed by the Principal Mr Carter, Head Prefect Lufilufi Lene-Isara and our senior Muslim student Ruhaan Saiyad. You can read Ruhaan’s address at the end of this article. We are providing support to all our boys over the days and weeks ahead; part of that is maintaining our school routines and also making sure that we are all looking after each other, today and in the future. Prefects and Muslim students who regularly attend the Kilbirnie mosque, accompanied by Mr Carter and Mr Simpson (Deputy Principal) then went to the mosque to lay a wreath on behalf of the college. 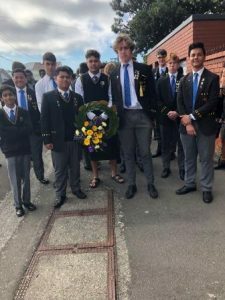 After laying the wreath, the boys respected a period of silence and then performed the school haka. Following is the very moving speech given by Ruhaan Saiyad at the assembly. “As-Salaamu-Alaikum, peace be with you. This is how we greet each other in Islam. By wishing peace upon those we meet. Peace is how we practice our religion. Peace is what those innocent worshippers in Christchurch felt, as they were getting ready for Friday prayers. But this peace was broken. By the cowardly actions of the terrorist. On 15 March, New Zealand’s darkest day, this deadly attack claimed the lives of 50 innocents as of last night, with many more injured. They were children and elders, men and women. Their families too have been affected, losing their loved ones. And for what? We must remember the victims. We will mourn them and we will grieve. But we must also stand united to prevent such a tragedy from ever happening again. I am not New Zealand born, I moved here with my family because we wanted to live in a country where we would be accepted, where we would be safe. After the terror attack, seeing the response and support of everyone in this country makes me proud to be a Kiwi Muslim. I want to thank you all for coming together and standing with the Muslim community. I have full faith that we will extend our school values beyond these walls and outward towards our communities. As our respected Prime Minister Jacinda Adern said – “to the terrorist, you may have chosen us but we utterly reject and condemn you”.